Had a way fun time at the downtown Baton Rouge Mardi Gras parade. It was family friendly, which meant no flashing required to get beads AND I was taller than the kids around me so could snag a lot of them. Don't I look like a success? Plenty of purple beads, and looking forward to the next opportunity to beg for these pieces of plastic. Such a funny tradition. 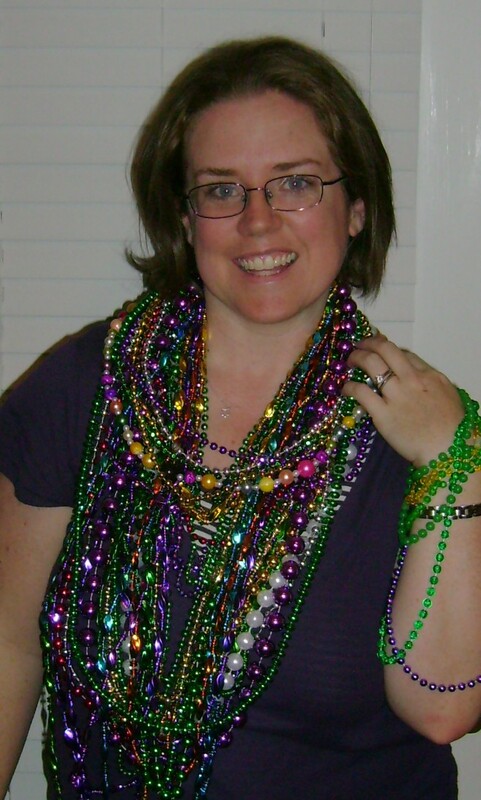 The theme of the parade was "Once Upon a Time" and I even got a commemorative bead necklace with a medallion on it ... but I'm not wearing that one in the picture. Louisiana rocks my socks right now! You'd fit right in when I'm watching "COPS" from New Orleans.